Freddie Miller was truly a world champion. Ignoring the comforts of fighting at home, Miller engaged in title fights in England, Spain and South Africa and fought at venues in Cuba, Mexico, Venezuela, Ireland, Canada and Belgium. He toured America as well, fighting in 18 different states. A clever and stylish southpaw, Miller kept a busy schedule throughout his career. Born on April 3, 1911, in Cincinnati, he turned pro in 1927 and fought 27 times that year, losing just once. He was featherweight champion from January of 1933 until May of 1936. Although he made 10 title defenses, he participated in countless non-title bouts. He engaged in 19 fights in 1933, 28 in 1934 and 35 in 1935. 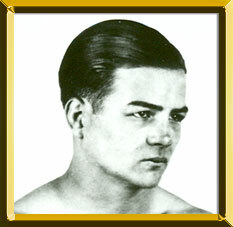 Miller was a member of the same stable as featherweight king Battling Battalino and in 1931 he failed in his first attempt to lift the crown from Battalino. They met again in January of 1932 and both men agreed that it was time to pass the title along to Miller. Their friendship impeded the competitiveness of the bout and Battalino fell from a phantom punch in the third round. Although he was counted out, the NBA and New York State Athletic Commission ruled the bout a No Contest. One year later, Miller would legitimately win the NBA featherweight title when he decisioned Tommy Paul. He made successful title defenses over Baby Arizmendi, Speedy Dado and Jackie Sharkey and then took his show on the road. Miller decisioned British champion Nel Tarleton in Liverpool and Jose Grinones in Barcelona and spent much of 1934 and '35 in Europe. With his win over Tarleton, he earned recognition as the undisputed champion of the world. Miller lost his crown to Petey Sarron by 15-round decision on May 11, 1936. It was the fourth time they met and the first time Sarron was able to figure out Miller's southpaw style. On July 31, 1937, they met in a non-title affair in Johannesburg and Miller earned a points victory. However, five weeks later they met again with the title on the line and Sarron cruised to a comfortable 12-round decision. In 13-plus years of fighting, Miller also defeated notable world champions such as Panama Al Brown, Freddie Cochrane and 1997 Hall-of-Fame classmate Chalky Wright. He also dueled with champions Sammy Angott, Leo Rodak and Jackie Wilson. In 246 career bouts, Miller was stopped just once, by Herschel Joiner in 1940, in what was his final pro fight. Miller died on May 8, 1962.